This site will look much better in a browser that supports web standards, but its content is accessible to any browser or Internet devices. Macromedia Flash Player 6 is required. See Help page. Three-dimensional, ie. a representation of a scene that allows for depth perception, as opposed to a one- or two-dimensional representation. A description of the anatomy of a human body that may include the precise the dimensions of each bone, the three-dimensional position of each bone, the mechanical relation between bones (how one bone responds to the movement of another bone nearby), the muscles involved in movement of any particular bone, etc. A method to represent data on a computer screen such that the data can be understood in terms of visual concepts instead of just numbers or other simple text. If the data represents three-dimensional scenes or movements, three-dimensional graphical animation is the more obvious choice to represent the data (as opposed to displaying numbers !). A communication protocol for transmitting information about musical events such as the change of pitch and musical gestures such as a pressing/releasing a piano key or changing the breathpressure when playing a wind instrument. While originally conceived for communicating information between musical instruments, synthesizers and other musical equipment, the protocol is nowadays used for controlling all kinds of other devices as well, eg. 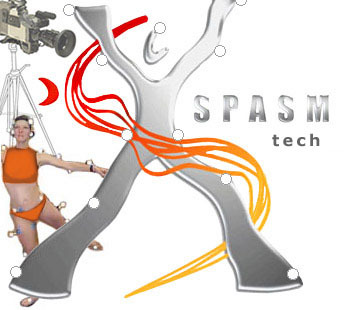 graphics/visual effects devices, stage lights, smoke generators, robotic devices, etc. A method to continuously measure the position of a human bodypart (or any other kind of object) for a period of time. While it can be implemented using a variety of technologies, one of the more common ways is to use video cameras that record visually reflecting markers, which are attached to the bodyparts of interest. After recording, specialized software calculates the three-dimensional position of each of the markers by using the images from all of the cameras on which the marker is visible. The marker position data can subsequently be applied to an anatomical model of the bodyparts of interest to obtain a graphically animated representation of the original movements. Short for 'picture element'. A way to describe visual information as tiny dots, where each dot is only parametrized by the color and intensity of the dot. A computational parameter to indicate that the calculations are occurring so fast that the computational output is perceived to appear at the same time as the event that started them. For example when a sensor outputs a signal that a human foot is touching the floor it may still take some time (in the order of milliseconds) before the signal is transformed into a digital message, arrives at a synthesizer and finally generates a sound. The time that passes between the perception of the person that s/he is touching the floor and the perception of the same person hearing the onset of the sound must be so short that it appears the two events occur simultaneously in order to be deemed to occur in real-time. A method to capture information about the environment or an object. Video cameras are examples of multi-dimensional sensors, capturing visual information using a two-dimensional array of sensors such that the visual information is represented as dots. One-dimensional sensors include flexion sensors that capture the bending of a surface, proximity sensors that capture the distance of objects, contact pressure sensors that capture the force exerted on a surface, etc.